Thank You, Pat Summitt: From One Tennessee Girl To Another I didn't realize that women didn't get the same recognition as men, and that they had to work twice as hard. I didn't realize this because Pat never made us believe it was or should be any different. 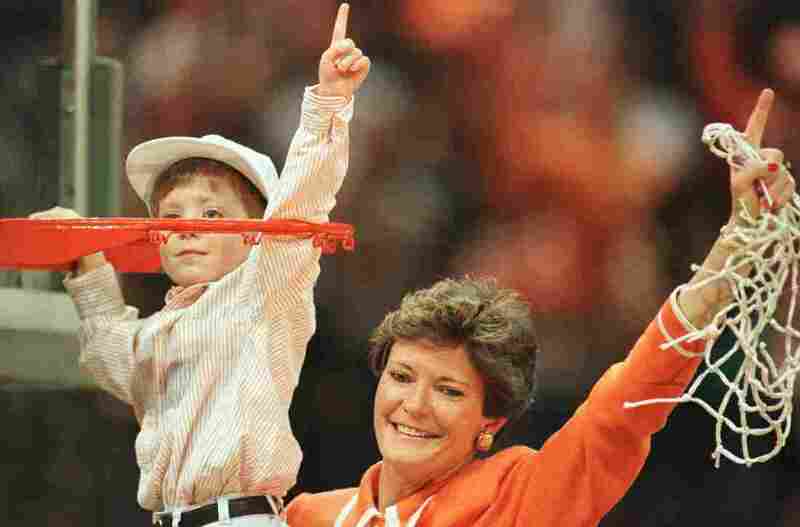 Tennessee Head Coach Pat Summitt of Tennessee celebrates with her son Tyler after the Lady Volunteers defeated Georgia in the championship game of the NCAA Women's Final Four in 1996. I wasn't born with an athletic bone in my body, and I've never played in a basketball game. 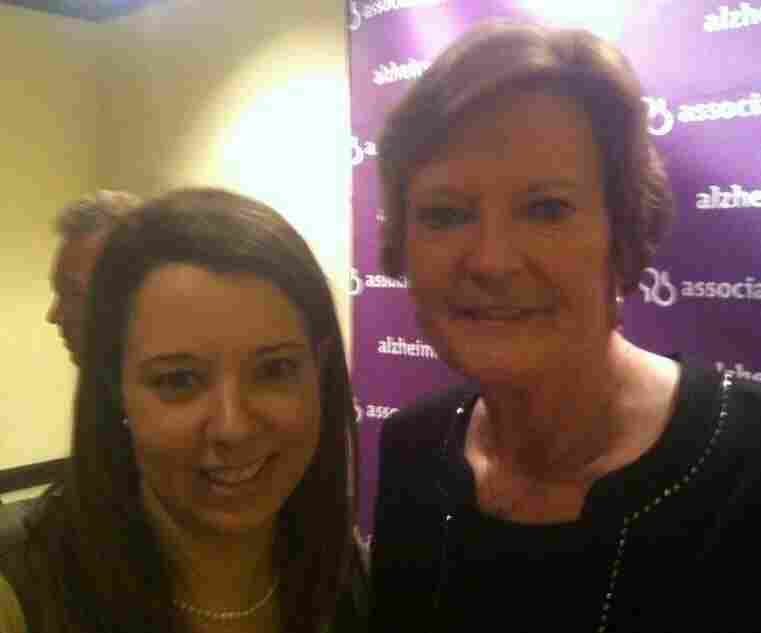 But Pat Summitt has been one of my idols for as long as I can remember. That's just the way it was when you grow up as a young girl in Tennessee. It's the only state in the country where the women's basketball team gets more acclaim and attention than the men's college team. I didn't realize that was an anomaly until I got much older. I didn't realize that women, in sports or otherwise, didn't get the same recognition as men, and that they had to work and fight twice as hard. I didn't realize this because Pat never made us believe it was or should be any different. My parents told me I could do anything I set my mind to, and as a kid growing up in the mountains of East Tennessee, I had an excellent role model who proved that. She was simply known to us as "Pat," and you talked about her like she was your next-door neighbor. You felt like she was. I grew up watching women's basketball games with my parents with as much frequency as we did Tennessee football in the fall. If they were trailing at halftime, my dad would lean back in his weathered, orange recliner and say, "Oh boy, Pat's gonna whip 'em into shape at halftime," referring to her legendary midgame intense "pep talks." "Here comes the stare," he'd say of her famed ice-cold glare if one of her players had messed up or wasn't giving it her all. Sometimes, if the game got too tense or too close, my mom had to leave the room because she was so nervous. It was serious business in the Taylor household. Pat never expected anything less than your best. "Here's how I'm going to beat you — I'm going to outwork you. That's all there is to it," she wrote in one of her books. Yes, Pat didn't like to lose — who does? And she won more games than any basketball coach ever, men's or women's. But she pushed her players to be the best they could, on and off the court. The most astonishing statistic of her nearly four-decades-long career is that every single one of her players graduated with a degree. She put in the same hard work they did, fighting to get women's basketball televised. When she was first hired at just age 22, she drove the team van and washed the team uniforms herself. It was a special treat for my parents to announce on a Saturday that we were packing our car up to make the two-hour drive to Knoxville to watch a game at sold-out Thompson-Boling Arena with fans singing "Rocky Top" at the top of their lungs. Men's games hours later would be about half as full, but we didn't go to those. As I was leaving a football game at Neyland Stadium one time with my dad, we passed by her. My dad yelled out, "Pat Head Summitt!" and she turned and stopped, gave us hugs, and we all yelled out "Go Vols!" She didn't know us, but in a sea of orange she stopped and shared a hurried moment with us. We were all Tennessee. She was — and is — Tennessee. I remember crying in my car when I heard she had been diagnosed with early onset Alzheimer's. Tennessee was already in a pretty rough sports period anyway (just see our revolving door of football coaches over the past few years), but the one constant was Pat. Her diagnosis was a gut punch — not just for the fans, but for the entire world of sports. She should have had so many years ahead of her, able to extend her amazing winning record and inspire so many more female athletes and young girls alike. Alzheimer's robbed us all of that. There was so much more she could have done. Alzheimer's is a disease I'm all too familiar with. I watched it rip my grandmother away from me when I was in middle school. By the time she died the week before I left for college, she hadn't recognized my mother, my aunt, or me — her only grandchild — in years. She was a shell of a human, her eyes glazed over in her nursing home bed as the machines beeped until it was only a long, flat-line hum. It's a disease that shreds your dignity and the things that are the very core of you — your memories, your personality, who you are. I live in fear I'm going to lose another family member to it. I imagine that the players and family members who visited Pat in her final days and hours didn't recognize who she had become. And she wouldn't have wanted them to remember her that way either. When Pat told the world five years ago she was battling this evil disease, I wondered how she would do it so publicly. You could begin to see the effects in her final year of coaching, and maybe even before. There wasn't the same tenacity on the sidelines, that trademark fire. It was heartbreaking to watch. I met Pat for the last time a few years ago, just after she had been diagnosed and had stepped down as head coach. She was speaking at an Alzheimer's event here in D.C., and after I gushed to a nice press aide about how much I idolized the woman, she let me in to talk to her. She grasped my palm, simply said, "Thank you, that's great to hear," and politely posed for a picture with me. Now, it's our turn to fight for her and to outwork Alzheimer's. For Pat Summitt. For my grandmother Iva Lee Grindstaff. For the 5 million people suffering with the disease, each whose family sees its own loved one's eyes get a bit dimmer every day. Keep fighting. That's what Pat would have wanted.